David Harbour ("Stranger Things") stars as "Hellboy," a demonic superhero who fights demonic supervillains, in the latest comic book reboot! Guillermo Del Toro's series has come to an end, and now Neil Marshall ("Doomsday") has taken over, with a story about Hellboy fighting a Blood Queen (Milla Jovovich) to stop her from taking over the world. 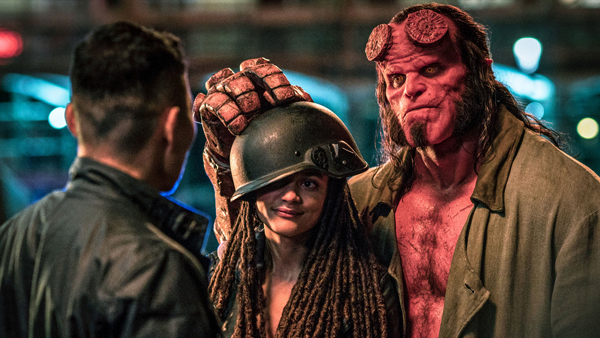 In his review of the new "Hellboy" at The Wrap, William Bibbiani critiques the film's shoddy visual effects but praises the hard-R horror creativity, describing the film as "like an issue of 'Fangoria' exploded, and all the movies in it got splattered onto the storyboard of a superhero flick."